Hogwarts School of Witchcraft and Wizardry or simply Hogwarts is a fictional Boarding school of magic for budding witches and wizards that appears in J.K. Rowling's Harry Potter novels and derived works such as the movie series. 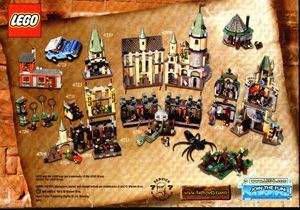 The school was also the subject of a vast number of LEGO sets from the Harry Potter theme, making up the bulk of this product line. Over the course of ten years since the theme's introduction, more than 20 different sets portrayed locations in and around the school, ranging from smaller sets which represent single rooms, over reproductions of whole building sections, to large models of the castle itself. This article presents an overview of the many different LEGO incarnations of the castle, its interior rooms and related buildings. Over the years there have been five versions of the set, all of which include Harry Potter. 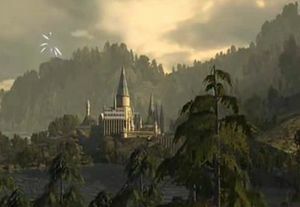 The first rendition of Hogwarts Castle appeared in 2001, the year when Harry Potter was introduced. This castle contained several generic places from the first book and film Harry Potter and Philosopher's Stone, such as the Astronomy Classroom, the Owlery, the Fat Lady's Corridor, the Library, the Great Hall and an arch for the boats to pass through, while more specific locations were released in separate sets, such as the forbidden third-floor corridor with Fluffy and the trapdoor, the Chamber of Winged Keys and the Giant Chessboard (though miniaturised), the room with the Mirror of Erised where Harry faces Professor Quirrel, the Potions Classroom, a generic classroom alongside the abandoned classroom where Harry finds the Mirror for the first time in the set 4721 Hogwarts Classrooms, and the Girl's Bathroom where Harry is attacked by the troll. Important recurring places that were turned into LEGO sets during the first year were the Gryffindor Common Room and Hagrid's Hut. The following year brought several locations related to the second book Harry Potter and the Chamber of Secrets and explored other parts of Hogwarts, such as Dumbledore's Office or the eponymous Chamber of Secrets itself. Also depicted is the Slytherin Common Room, the place where Dobby receives his sock of freedom (likely Professor McGonagall's Office), Moaning Myrtle's Bathroom, and the Great Hall as it is seen during the Duelling Club scene. Also, a section of the Forbidden Forest was featured in the set 4727 Aragog in the Dark Forest, and the Quidditch Pitch was depicted in the set 4726 Quidditch Practice. With the release of the Harry Potter and the Prisoner of Azkaban subtheme in 2004, a new version of Hogwarts Castle was released, which contained the Clock Tower, Gryffindor Tower, the Divination Classroom, the front gates, a generic classroom, and a corridor with a trapdoor. Featured in other sets were theDefence Against the Dark Arts Classroom, the third floor corridor with a secret passage to Hogsmeade Village and the Dark Tower where Sirius Black escapes the Dementors on Buckbeak. A new version of Hagrid's Hut was released as well. 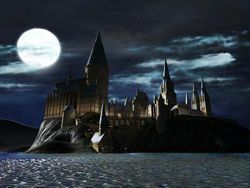 The only new additions to Hogwarts in 2005 were some sets that showcased several sites of the Triwizard Tournament; part of the Mervillage in the lake, and the Dragon Arena. There were no sets depicting any part of the actual castle itself, only of the grounds. The 2007 castle focuses mostly on the "Order of the Phoenix"
The third Hogwarts Castle set, from 2007, has three buildings: the Room of Requirement, the Greenhouse, and the main Castle section. There a some new rooms in this set including; Professor Umbridge's and Professor Snape's Offices, Gryffindor Tower with a fireplace and dormitory bed, A Trophy Room, an Astronomy Tower, and the Entrance Hall. This set features the greenhouse with mandrakes despite this location playing a more significant role in Chamber of Secrets, not Order of the Phoenix. 4842 Hogwarts Castle from 2010 is currently the largest model of Hogwarts (by number of pieces). It contains many new, redesigned, and exclusive minifigures, as well as some brand new rooms that never appeared before in LEGO form, such as the Restricted Section of the Library, the Room of Hidden Things, and an Astronomy Tower balcony. It features a more intricate design in the construction of the outer walls, which consists largely of smaller bricks than of large, single-piece panels. The set recreates the Great Hall from the first castle, and Dumbledore's Office from the 2002 set 4729 Dumbledore's Office. Also seen is a new trophy room, the Gryffindor and Slytherin Common Rooms, and a corridor with a knight statue. Hagrid's Hut was updated in the set 4738 Hagrid's Hut, as was the Quidditch Pitch in the set 4737 Quidditch Match. The set 4736 Freeing Dobby, is based around an arch from a Hogwarts corridor. In 2011, LEGO released 4867 Hogwarts (formerly 4867 Battle for Hogwarts) which included a viaduct bridge,(which can explode by turning a dial on the end of the viaduct) an updated astronomy tower,(with a new LEGO globe) a divination classroom, dungeons, two of the Room of Requirment's forms, Professor Lupin's office, and the Mirror of Erised. It was built in the same style as 4842 Hogwarts Castle and the two may be connected. More of the Forbidden Forest is featured in the set 4865 The Forbidden Forest. In LEGO Harry Potter: Years 1-4 the castle appeared as one of the game's two hubs, the other being Diagon Alley. In LEGO Harry Potter: Years 5-7 the castle has an updated look inside and outside. The Hogwarts Castle set from 2004. 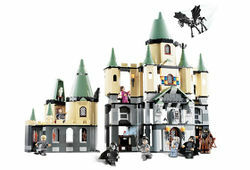 Most sets, particularly the four released large Hogwarts Castle sets, use pieces in grey and tan for the walls and sand-green roofs. Most of the single-room sets were similar in style to the bigger castles and had a floor and sometimes a ceiling or even outer wall and tower structures, so that they could be easily combined to form a bigger Hogwarts. Since the large sets already had a modular structure, this allowed the various rooms to be rearranged to the owner's liking. But there were also some smaller sets that only included interior furnishing and just a wall segment or even no walls whatsoever, such as 4722 Gryffindor House or 4721 Hogwarts Classrooms, which included cardboard walls. To allow easier access to the interior, for better playability, the buildings and rooms are not fully enclosed and in most cases have their walls at only one side, which means that the backside is usually completely open. Some rooms don't even have solid walls but rather big archways with large openings instead. Although the Great Hall plays a significant role in the Harry Potter films, it appears in only two sets, the first model of Hogwarts Castle from 2001 and its latest incarnation from 2010. Both LEGO renditions of the hall are considerably smaller than the location it is modeled after. The first version contains only one table, a fireplace and Dumbledore's seat at front of the hall. The room is also very narrow, since its just a half room that has the outer wall with the facade on one side and is otherwise open to allow easier access to the interior. The hat for the sorting ceremony that takes place in this hall was released in a separate set. The newest version of the great hall contains two tables and four accompanying benches, as well as two seats for the staff and the sorting hat. Other than in the previous representation, the floor area extends more into the interior of the whole castle set itself and looks less cramped. The first Chamber: Harry has to pass the three-headed dog Fluffy. In Harry Potter and the Philosopher's Stone several obstacles, that are found in a series of rooms, most be overcome to reach the eponymous stone. In the book there were seven obstacles, but six of them can be found in LEGO sets. The first two challenges are portrayed in 4706 Forbidden Corridor, which contains the initial entrance, a trapdoor guarded by Fluffy, the three-headed dog. Underneath the trapdoor is the chamber filled with Devil's Snare. The third obstacle, the room with the winged keys, appeared in another set, 4704 The Chamber of Winged Keys. This set also contained the next room with the fourth challenge, the giant chess set, although this LEGO rendition did not contain a complete chess set but only a 3x3 array of chess fields with a minifigure-sized (giant) chess king. The next obstacle, which appeared earlier on in the story was the giant mountain troll, found in 4712 Troll on the Loose. The sixth obstacle, Snape's Riddle, can not be found in a set. The last obstacle could be found in 4702 The Final Challenge, which contained the Mirror of Erised and the Philosopher's Stone. The Potions Classroom was portrayed in the set 4705 Snape's Classroom, which recreates the vaulted ceiling of the original and contains a cauldron, a table with potions, and a potions shelf with several bottles. It contains Professor Snape, Peeves and Ron Weasley. The Defence Against the Dark Arts Classroom could be seen in 4752 Professor Lupin's Classroom. It featured some draconic skulls hanging from the ceiling, some tables and shelves with potions and various dark objects, skulls, and a chocolate bar. The main feature of the set is the cupboard with the boggart in it. There are no desks or chairs for the students. A staircase to the side leads to the DADA teacher's office, with a gramophone, suitcase, and more potions and skulls. This set featured Professor Lupin, Neville Longbottom and Boggart Snape. The Divination Classroom was portrayed in the sets 4757 Hogwarts Castle and 4867 Hogwarts. "4757 Hogwarts Castle" contained some tables, a crystal ball, some mugs and potions bottles, and a chest with a magnifying glass inside. "4867 Hogwarts" was notably simpler, including three small tables, a crystal ball, and two mugs. Only the former set features Professor Trelawney. Other sets, including 4757 Hogwarts Castle, and 4721 Hogwarts Classrooms showcase various generic classrooms. The Gryffindor Tower which houses Gryffindor's common room and dormitory is one of the few locations that appeared in more than one set. 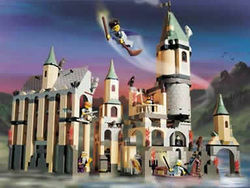 The first rendition was a part of 4709 Hogwarts Castle from 2001. As all later incarnation of the room, it already had the portrait of the Fat Lady affixed to a revolving wall piece which served as main entrance. It was also built into one of the actual towers of the castle set. Another version was 4722 Gryffindor House from the same year. That set contained only the interior furnishing, including a bed, but had no walls except the section with the Fat Lady's portrait. One more version was included in 4757 Hogwarts Castle from 2004, again in an actual tower, which also included a dormitory with beds. Gryffindor's common room made its latest appearance as part of 4842 Hogwarts Castle from 2010, where it took up a level in a tower which also contained the Slytherin dungeon in the basement. The common room contained two chairs and a table. The Gryffindor Dormitory, represented by a bunk bed with Gryffindor-style colors, was included in 4867 Hogwarts. The Headmaster's Tower with Professor Dumbledore's office appeared in its own set in 2002. Just like the original from the films, this version has a stone gargoyle that guards the entrance and a spiral staircase behind it. The antechamber (behind the gargoyle) includes some shelves and cabinets, decorative spears, and a book. The actual office has a desk, a chair, a potions shelf, a key and some generic magical pieces. Another version of his office is included in 4842 Hogwarts Castle, and features the Headmaster's desk and chair, the Daily Prophet, a crystal ball which may be meant to represent the Pensieve, a place for the Sorting Hat and the Sword of Godric Gryffindor, and some potions shelves. Professor Trelawney's office was a part of 4757 Hogwarts Castle. It is an extended part of her classroom, and only features a chest with a purple magnifying glass. Professor Snape's office appeared in 5378 Hogwarts Castle. It features two desks, a crystal ball, a magical lightning piece, a cabinet, and some potions. Professor Umbridge's office appeared in 5378 Hogwarts Castle. It is decorated in pink, and has a desk with a quill, cup, flowers and parchment, a lamp, a chair, and an opening cupboard for confiscated items. 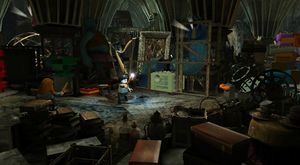 Professor Lupin's office is included with 4752 Professor Lupin's Classroom and 4867 Hogwarts. The former included a gramophone, a suitcase, desks, a book, a potion, and a skull. The Slytherin Dungeon appears in 4735 Slytherin. It does not contain any seats, but contains a table with potions. It is primarily green in colour, with decorative snakes, a Slytherin shield, a printed wall piece for the entrance. The dungeon appeared again in 4842 Hogwarts Castle, where it was located in the basement of a tower that also housed the Common Room of Gryffindor on an upper floor. This new version of the contained two chairs and a table, as well as some snakes, a Quibbler, and a Slytherin Crest tile on the wall. The girls' lavatory in which Harry fights the troll was turned into its own set, 4712 Troll on the Loose. The bathroom that contains the entrance to the Chamber of Secrets was contained in 4730 The Chamber of Secrets. The Chamber of Secrets appears in its own set but also contains the entrance at the girls' bathroom. The model of the actual chamber recreates the look from the movie and on one end of the chamber sits the statue of Salazar Slytherin's head, where the Basilisk hides. The side walls are adorned with snake heads which are just flat pictures printed onto wall panels and not actual statues. Although Hogwarts' Greenhouse first appeared in Harry Potter and the Chamber of Secrets it did not appear in any LEGO sets until the release of 5378 Hogwarts Castle in 2007. The Greenhouse contains mandrakes and a blackboard. The Room of Requirement first appears in 5378 Hogwarts Castle in 2007, it has a wand holder, and a practice target for the D.A. (Dumbledore’s Army) meetings, in the roof is a owlrey and rat, it also has Hogwarts banners. The room holds together to make one building. In 4867 Hogwarts it is remade and has two portraits of wizards and also includes Lucius Malfoy with his Death Eater form to resemble the practice dummy seen in the film. The Room of Hidden Things is a particular form the Room of Requirements takes on. In 4842 Hogwarts Castle is the Room of Hidden things witch include a Vanishing Cabinet that Dark Wizards might use to sneak into Hogwarts. In 4709 Hogwarts Castle it first appears in at the top of the tower also housing various room. It featured a removable roof, a blue book and shelf, and a telescope that rotates 360 degrees. It next appears in 5378 Hogwarts Castle above the Trophy Room and it has a window to look out of. It features a star chart and a movable telescope. 4842 Hogwarts Castle has an open tower to view the skies and a telescope that can move 360 and up and down. Its latest appearence is in 4867 Hogwarts where it appears rounded and like the film adaption. It has a grey globe printed wih what looks like a star chart. In 5378 Hogwarts Castle on the second floor is the Trophy Room with trophies, ribbons, gems, and golden objects. 4842 Hogwarts Castle also has a Trophy Room, with a Trophy Case that says James Potter - Seeker. 4701 Sorting Hat (2001), actually contains only the hat and not the surrounding room. 4704 The Chamber of Winged Keys (2001). The first two waves of LEGO Harry Potter sets combine to make Hogwarts. 4712 Troll on the Loose (2001). 4721 Hogwarts Classrooms (2001), includes cardboard walls. 4722 Gryffindor House (2001), includes cardboard walls. 4730 The Chamber of Secrets (2002)..
4733 The Dueling Club (2002). 4751 Harry and the Marauder's Map (2004). 4752 Professor Lupin's Classroom (2004). 4753 Sirius Black's Escape (2004). Only the characters of Harry Potter, Hermione Granger and Albus Dumbledore have appeared in all four renditions of Hogwarts Castle. The characters of Ron Weasley, Draco Malfoy and Severus Snape have each appeared in three out of four Hogwarts Castle sets, though not in the same ones. 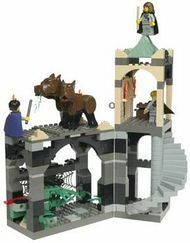 The knight statue appears in two renditions of the castle, but half a knight minifigure appears in 5378 Hogwarts Castle. Similarly, Rubeus Hagrid appears in two out of four Hogwarts Castle sets; 4709 Hogwarts Castle and renditions, whilst Dementors (in pairs) appear in the opposite two Hogwarts Castle sets; 4757 Hogwarts Castle and 4842 Hogwarts Castle. This page was last edited on 9 January 2016, at 23:17.